Unique torque arm for smooth 90º turning motion. Powered chain driven live roller conveyor included. Up to 4000 pound capacity. 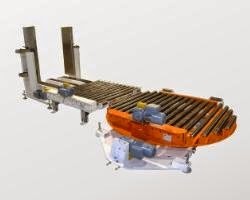 Can be fully integrated with existing pallet handling conveyors.